Can Convention Delegates Still Dump Trump? 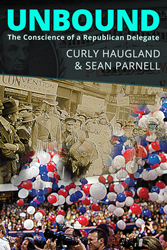 A new book, Unbound: The Conscience of a Republican Delegate, co-authored by Sean Parnell and Curly Haugland and published by Citizens in Charge Foundation, makes a strong case that delegates are not bound to vote for any particular candidate based on primary and caucus results, state party rules, or even state law. The book, released today, documents the nearly 240 instances at past conventions in which delegates have invoked their right to vote their conscience. “The Republican National Convention has, throughout its 160-year history and with only a single exception, always upheld the principle that delegates have the right and authority to vote their conscience for whom they believe will be the best standard bearer for the Republican Party in the general election,” according to co-author Sean Parnell, past president of the Center for Competitive Politics. “The delegates in Cleveland clearly cannot be bound to any specific candidate and therefore anyone can become the nominee for November,” continued Parnell. One hundred and sixty years ago, the first Chairman of the Republican National Committee gave the inaugural address at the first Republican National Convention, telling the delegates gathered there that they should take “no position which does not commend itself to the judgment of our consciences.” From that day forward and through thirty-eight of the next thirty-nine conventions, the Republican Party has steadfastly rejected any and all attempts to force delegates to vote against their conscience. “Binding is an assassin of freedom,” continued Haugland. The right of delegates to vote their conscience has been protected for the past 136 years through a rule originally crafted by James A. Garfield at the 1880 convention. The book sets forth the inescapable conclusion that the Republican delegates preparing to gather in Cleveland not only have the right to vote their conscience, but that right is explicitly guaranteed by the rules currently in place governing the convention. “This book isn’t about trying to stop Trump from being the nominee. It is about saving the Republican Party whose core values are at the precipice of extinction,” stated M. Dane Waters, a veteran of five Republican presidential campaigns and an advisor to the book effort. “If the delegates freely choose Trump then so be it, but let their conscience decide and do it with a unified voice that isn’t silenced by the RNC staff who simply have no authority in the nominating process,” continued Waters. The book can be downloaded free of charge by visiting citizensinchargefoundation.org or by clicking here. Citizens in Charge Foundation is a not-for-profit and non-partisan charitable foundation working, through education and litigation, to ensure citizens understand their rights within the political process and that they are fully in charge of their government.